“Baba Residence” is one of the innermost dreams- come-true of Ideas Factory. 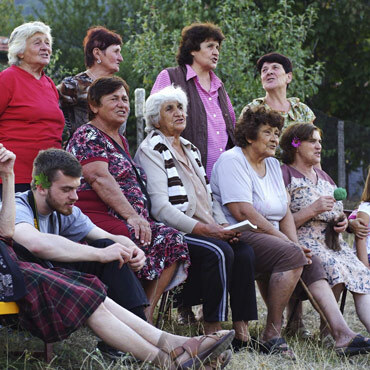 We connect urban youth and elderly from different villages across Bulgaria in an innovative socially entreprenerial model which combines design thinking, ethnographic fieldwork skills and… the simple wisdom of a rural lifestyle – with a granny – for a period of 3 to 5 weeks! We believe and proved in practice that, on one hand, those vibrant elderly, who we meet in the many-coloured Bulgarian villages, are able and want to bring forward traditions and cultural/ social practices that are about to become extinct. On the other hand, young urban people are open to learn from them and share knowledge and could contribute to reinstating the elderly from the villages as an active part of our society. In other words, you could have a granny/ a grandfather / a household with whom to share knowledge, skills and stories – one that could really find your daily help useful. All the participants whose applications have been approved, firstly, go through an intense training on methods like human-centered design, social entrepreneurship and ethnographic fieldwork skills. After their 1-month co-living with the elderly, the residents become a part of our Incubator for Baba-innovations. Then they can start working on individual or group social or cultural entrepreneurial ideas to help the villages and their dwellers – with the support of trust-worthy mentors! Main idea of Baba Residence is not only to preserve the precious traditions, crafts, personal and folklore stories of local people, but to inspire their reintegration into cultural and social entrepreneurial solutions in aid of Bulgarian villages. New initiatives, products, services and events which draw cultural and economic potential to those forgotten parts of our countries are born. Another significant result from the interaction between young urban people and elderly from the villages is the seed of solidarity – between generations, between urban and rural communities and culture. Baba Residence has been to 3 different regions the last 3 years. In 2016 the Residence took over brand new perspective – in Northwestern region in Kostalevo, Pavolche and Chelopek and in 2017 – in Lazhnitsa village in Gotse Delchev region of Bulgaria. In September 2018 it will happen in 2 villages in the region of Karlovo. The result after 1-month co-living and co-creating between urban youth and elderly from the villages? Bright and colorful ideas how to preserve and nourish the uniqueness of these wonderful villages, to revive local economies and find solutions for existing social challenges. One part of the residents develop original business ideas, which have the potential to bring sustainable economic impulse into the villages and to answer its’ urgent needs in a completely new way. All ideas become part of the Social Innovation Incubator of Ideas Factory. During The incubator they receive mentoring support by the experienced professionals from IF’s mentors pool and guest experts. The residents have the opportunity to develop their social entrepreneurial skills and take their ideas closer to realization. • renovation of the old bakery in Dzhurkovo village, where the residents baked around 600 little breads for the local people to celebrate it together. One of the most important intangible results of Baba Residence is the new quality of human interaction – solidarity between generations, between urban and rural communities. More about Baba Residence’s journey through the years -> HERE. The project is part of the program of Plovdiv – European capital of culture.